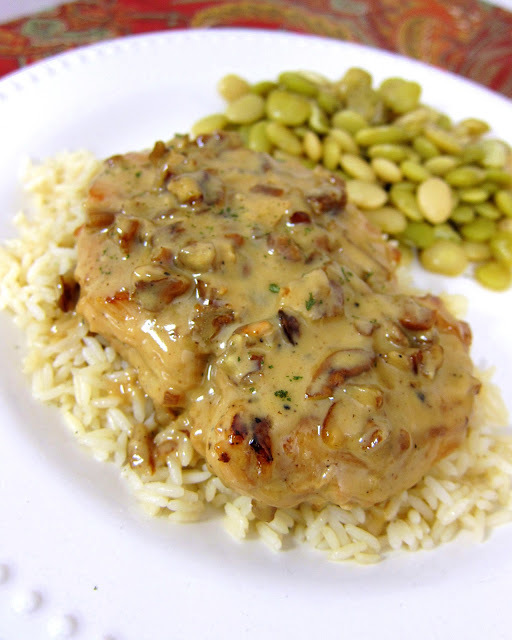 Toasted Pecan Chicken Recipe - pan seared chicken simmered in a creamy orange dijon sauce and toasted pecans. AMAZING flavor! Only takes 20 minutes from start to finish - no prep work. I am going to double the sauce next time so I can pour it over the rice. YUM! My Mom has been raving about this dish for years. I've resisted making it because it just didn't sound good to me. Boy, was I wrong. This was absolutely delicious! The sauce was so yummy. I am going to double it next time so I can pour it over the rice. The original recipe used toasted almonds. I love almonds, but I didn't have any on hand. I used toasted pecans and it was great. This only takes about 20 minutes to make. I served the chicken over some Uncle Ben's Ready Rice - I love that it is ready in 90 seconds in the microwave! Make this tonight. Trust me - everyone will love it! Pound chicken thin between wax paper. Season with salt and pepper. In a large skillet, melt butter. Cook chicken over medium-high heat for 3-4 minutes per side. Remove chicken from skillet. Reduce heat to medium, add whipping cream, marmalade, and mustard, stir well. Add chicken, sprinkle with pecans, and cook 8 min or until sauce thickens. Do the nuts stay hard or do they soften up a bit? TheMoMo - the nuts weren't super crispy, but they weren't mushy. I toasted them prior to putting them in the sauce. If you want them softer, don't toast them. If you want them super crispy - add them right before serving. Lisa - what about trying an apple jelly in place of the orange marmalade? I think the flavors would work. Pineapple preserves would be very good! This would be delicious with almonds! I just made this tonight. Definitely going to add it to the rotation. I subbed homemade apricot jam for the orange marmalade and it worked great. What can be subbed for the heavy whipping cream? I am on a diet and I don't buy that sort of stuff. Looks awesome though. Angela - you can use evaporated milk or half & half. You might want to add a touch of flour with the milk to help it thicken up. Enjoy! We made this tonight and it was amazing. It was a definite "make again" dish. Thank you! Is the mustard really prevalent tasting in the recipe? I don't care for it but this looks so yummy! This was a hit at my house! I left out the pecans because I do not like nuts in my food. The kids especially liked the sauce. A friend made this for my mom's bday and it was the hit of the evening! Question though, as I am a terrible cook, do you put the chicken and sauce in the oven for 8 minutes or keep it on the stove. I am so sorry for the dumb question!! Can this dish be frozen and then reheated? Will the cream separate? Can this dish Be frozen and then re-heatedly, keeping the same quality? Delicious dish.....I used 'honey mustard' and added more honey mustard for individual taste. Nice and easy dinner.